Spray guns functionality in paint shops is critical for maintaining quality finishes on paint jobs. At BECCA, we have found issues regarding the performance and maintenance of spray guns. We approached this challenge by acquiring spray guns used in the field, then studied various issues found. Next assessing how to prevent each from occurring. We cut each gun in half, which enabled us to observe build-up of paint materials, wear and tear on internal components. (Pictures of cut-away guns here) From this analysis, we began building a process around protecting the areas of concern. 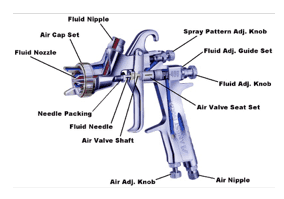 Needle: Paint buildup on the needle can cause trigger sticking and disrupt or reduced fluid flow, affecting your spray guns ability to spray effectively. Air Cap: Build-up and blockages in the air cap will prevent proper air flow, resulting indisrupted the spray pattern, causing paint defects such as tiger stripping, mottling, or other paint related issues. Air Distribution Plate: Build-up and blockages on the Air Distribution Plate will prevent proper air flow, disrupting the spray pattern, causing paint defects such as tiger stripping, mottling, or other paint related issues. Air Passageways: paint will work its way into the air passageways affecting air flow through the spray gun. With waterborne materials on internal components of the spray gun eventually will cause corrosion.